The GBP to EUR rate is heading higher say researchers at a leading Scandanavian research house as the UK goes into the EU referendum vote. The pound is in wait-and-see mode around the 1.30 area on the morning of the UK's referendum. 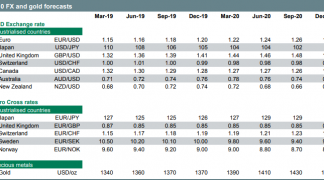 This pause refflects an underlying uncertainty in the currency market which tends to settle in the lead up to a big event which is expected to deliver huge swings in the FX markets. Nevertheless, the underlying momentum behind the UK currency is positive and there are signs that the next move from here will be up. "With the bookmaker Brexit chance hovering around 25%, the market is trading rather optimistically, with USD broadly weaker. The GBPUSD has hit the 1.4844, the highest level year-to-date, as the EURGBP is approaching May lows," says Holger Sandte at Nordea Bank. A number of big investment banks have reported they are seeing long-term 'real money' demand for the British pound continue to grow. It appears to be one of the big reasons that sterling has recoverd so spectacularly over recent days. The CitiFX Global Flows team have reported that longer-term focused real money investors have been buying into sterling for 9 of the past 10 weeks. UBS report sterling attracted the highest normalised net inflows in G10 (the second-strongest GBP net inflow in 6 months), led by asset managers and hedge funds. The majority of the net flow came in the second half of the week, as GBP began its recent rally. This demand, by that sector of the market which would typically have longer-term investment views, should give a good hint at where the exchange rate is going - up. The question then is, how far can the rate go? Sterling has risen as traders look to close the gap between the exchange rate that accounts for the risks associated with the EU referendum and the 'fair value' level implied by the country’s economic performance. We have already looked at the issue of potential post-vote levels for sterling here, but the debate certainly opens up when we consider different analysts have different ideas of what ‘fair value’ looks like. For readers wanting to know where the pound is headed, it is a simply a case of absorbing as many opinions as possible and siding with the most compelling. The latest arguments in the GBP/EUR debate comes from DNB Markets - they are the investment bank arm of DNB, Norway’s largest bank. I have been a fan of DNB's work over recent months; they have made some pretty good calls, for instance calling a turn in GBP/EUR trend when it seemed the rate would keep plumetting. Like the majority of analysts, DNB see the timing of interest rate rises at the Bank of England as being key to stimulating further advances in sterling. This is because countries with higher interest rates tend to attract higher capital inflows, which in turn drive the value of the currency up. The only problem is, countries that command higher interest rates must have strong economic growth and inflation that is comfortably above 0%. GDP-growth fell to 1.6% saar in Q1, probably dampened by Brexit-fear. CIPS indices have fallen for manufacturing and construction, but risen for services. Unemployment fell to 5.0%. Wage growth ex. bonus rose to 2.3% in April. Headline inflation stable at 0.3% in May. Core inflation unchanged at 1.2%. The Brexit-debate has increased uncertainty and financial market volatility. However, DNB do believe that 2017 should see up to two rate rises. This forms the backbone of the theory that sterling will rise gradually into mid 2017. It is argued that the UK economy is still fairly solid and IR expectations are likely to slowly increase again. This is therefore an upgrade for GBP/EUR from 1.3513 to 1.3888. DNB also cite a strong labour market dynamics for their pro-GBP analysis. However, they do acknowledge that inflation and wage growth remain in tune with global dynamics and remain weak. If anything, softness in prices are the number one risk to the British pound’s outlook in the sense that it would delay any pro-GBP interest rate rises. 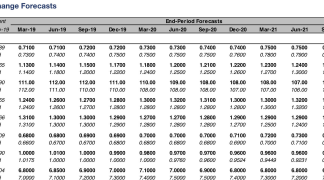 DNB are forecasting the pound to trade towards 1.3698 by the start of 2017, moving lower to 1.3888 by June 2017. This contrasts to consensus estimates which see the GBP to EUR exchange rate trading at 1.30 by the end of the year, rising to 1.3295 by the middle of 2017. Leaning on DNB’s side are fellow Nordic bank Nordea and UK lender Lloyds, whose research and targets can be found here. Looking at the other side of the equation, DNB reckon the European Central Bank (ECB) will have to enact another 10 basis point interest rate cut while extending their APP programme into 2020. This would be a classic example of policy divergence - where the BofE is raising rates, the ECB is cutting rates. This exacerbates the interest rate yield advantage enjoyed by the UK, thereby driving GBP/EUR higher. Eurozone growth is positive, but anaemic while core inflation is slowing. The ECB is in wait-and-see mode for now, gauging whether their recent cuts and quantitative easing measures are having an impact. "Inflation will pick up this year, lowering the need for ECB to act now. But as inflation slows again, ECB will cut deposit rate by 10bp, and extend APP further," say DNB. Indeed, ECB President Mario Draghi told European lawmakers on June 21st that, "more action needed to boost Eurozone investment." Draghi justified the call on the assumption that inflation would remain, "at low levels in coming months." His words surprised markets which had not expected more monetary stimulus so soon after the large programme launched at the start of the year. 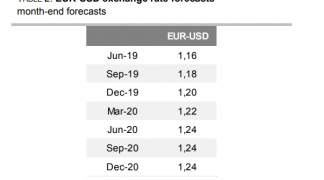 "We continue to expect some form of additional monetary easing from the Governing Council in the final quarter of the year which, in our view, should recommence the Euro’s downward path against almost every major currency," says Matthew Ryan at Ebury Partners. The final pre-vote poll (from ComRes) showed a small majority for ‘Remain' and the pound is higher. Remain are on 48%, Leave on 42% and 11% undecided. Market risks were broadly symmetric a week ago when opinion polls shifted in favour of ‘Brexit' but the last few days have changed that. "A decision to leave the EU is bad for global risk sentiment, good for the yen, and bad for sterling, the Euro and higher-beta currencies particularly central and Eastern European ones," says Nordea's Sandte. The options market is still priced at extremes (GBP bearish), e.g. 1M 25D GBPUSD risk reversal is trading at -9.80 vols, lowest level on record. Being short GBP, to break even in the options market, one needs to see GBPUSD below 1.44 in 1 month.